We’ve all read the story of The Tortoise and The Hare. I’m pretty sure the Tortoise and the Hare were not racing for one million Thai baht, but Hi-Tech was, and they nearly were the “Hare” in this race. In basketball, there are no cake walks. If you want something, you work hard for it. And you have to work hard for it all the way. You don’t work hard for something 95% of the way and then go in to Cruise Control. Hi-Tech needed to win to clinch the BTSL title or else the fate of the title would go in to the hands of the Nakhon Pathom Mad Goats who would playing a one-win Thewphaingarm team. They needed to win this game. The Mono Vampires, the opposition, on the other hand had clinched the BTSL third and final spot for the Toyota International Invitational Tournament.They wouldn’t improve their standings even with a win or a loss. It seemed like an easy bet. A highly-favored Hi-Tech team coming off a huge victory with winning as their only option, going against the slight underdog that didn’t really need to win and could afford a loss. After talking with some people, the majority said Hi-Tech would win, not because of the talent gap, but because of a expectation of outcome. Someone should have told the Mono Vampires that. This was a pretty close game and it really could have come down to a butterfly flapping its wings in the Amazon forest to swing the game the other way. One thing Hi-Tech did well (and has done well throughout the year actually) is getting the most out of their bench players and managing the bench playing time. 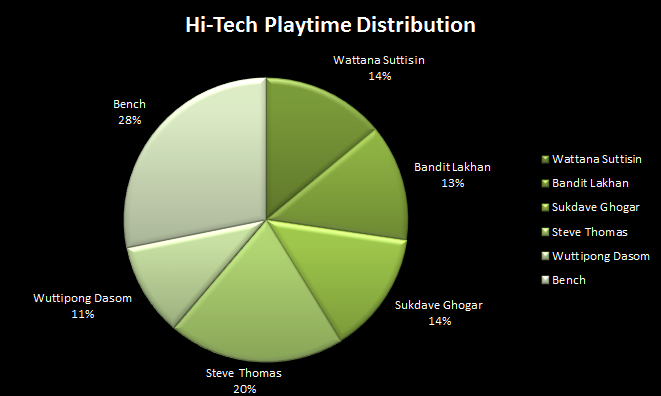 The Hi-Tech Bench played in 28% and they accounted for 28.6% of the total points (16 of 56). Hi-Tech were comfortable playing their bench because they performed well in the minutes given. This in turn, would have kept the Starters more fresh into the more crucial minutes of the game. For Example, “James” Supawich Khukhandin had never logged a single minute in the BTSL before and came into this game playing 14 minutes and scored 9 points while being an important piece in the second quarter swing that got Hi-Tech into the lead. With the starting backcourt (Wattana Suttiin and Bandit Lakhan) not quite on target in this game (combined 7 for 25), James came into the game and slowed down the tempo and made big shots. Shopper finished the game shooting 5/10 from three-point range and received the same kind of superstar defensive treatment that “JO” Ratdech Kruatiwa got from Piyapong Piroon in the latter parts of the game. Defense is supposed to be Hi-Tech’s strong suit, so it’s no surprise that they did well in this area. They pushed Mono into multiple forced late shot clock heaves and shots they didn’t want (except for Shopper. Did I mention he was on fire?). Piyapong Piroon was his usually self and was assigned from Sorot Soontornsiri to Shopper, depending on who was getting hot. Steve Thomas was his regular inside stopping defensive presence, stopping the one of BTSL’s most formidable offensive forces to 8 points off 3/10 field goal shooting. And of course there was the block from Sukdave Ghogar that wiped out all hope from Chanachon Klahan’s attempt to tie the game up in the waning second of the game. I’ve been harsh on stars when they play below average, but that’s the whole point. No one would care if Bogdan Bogdanovic played a horrible game because he’s not a game changer. But if Steph Curry kept shooting blanks, at least one person is bound to say something about his performance. Here is one of the biggest issues of the game. Wuttipong Dasom is supposed to be the “Next Big Thing” in Thailand Basketball. He’s been living up to the title so far in the BTSL, having scored 20 and 17 points prior to this game. And then he just suddenly vanished. Reuben went 0 for 5 in this game and committed 4 turnovers and displayed everything that I have claimed is the wall between him and Superstardom: Shot Creating, Ball Handling, and Offensive Consistency. I still believe that he still has the potential to be the “Next Big Thing” but he will have to find a way to improve in those areas of the game quickly as the current stars of Thailand get older and he enters his prime. Yeah, we know it frustrating. PS. Our “Reuben Hair Watch” was totally worth it! Reuben switched it up to a football hair band and a pulled-up tuft. I can’t wait to see what he’ll pull off in the International Round. The late game execution was a bit confusing from the Mono Vampires. 1. The coaching staff didn’t call a timeout once they got possession of the ball, down by 2 points with 38 seconds left on the clock in the 4th quarter. This is understandable, as they were probably saving their last timeout for possibly their last possession, but if they had called a timeout they might have been able to set up a pretty good shot. 2. Chanachon got tangled up and a jumpball situation was called with the possession arrow to the Vampires with 4 seconds left on the shot clock. And then the Vampires final timeout was called. Again; understandable since they needed to make this basket, but they could have set up a better shot as mentioned earlier. The set-up piece was probably for McClain to set a screen for Shopper and get him free for the three-point shot, but that broke down quickly so they had to resort to Pairach Sekteera rushing into a corner where he got the ball and wasn’t in position to do much else after. I guess you could praise Hi-Tech for their defense, but I also think that the Vampires could have at least set an Elevator play [LINK] or some variation Double screen to surely get Shopper the ball. For me, that’s how close this game really was. The things they did well and struggled with cancelled each other out, and it possible could have been left at this one late timeout that changed the outcome of the game. In this part, I talk about the things I liked and did not like from watching this game. 1. Honey, I’m Home! : “Bas” Kannut Samerjai is back! The TBF 2015 4th Overall draft pick had missed more all but 1 game of the BTSL season prior to this game and it was a nice scene to see him back on the court. He was rusty as could be, but he’s back and the court and he should be ready to terrorize the teams in the Toyota International Invitational Tournament. 2. Sideshow Bob: A lot of talk about this game revolved around “James” Suppawich Khukhandhin’s out-of-nowhere performance, but I felt impressed about what “Rung” Nakorn Jaisanook displayed in this game. He always been known as a sharpshooter, but today he showed that he has a good sense of penetrating and passing as well. Also known as “Bob” among team mates and fans, he should be able to evolve into a bigger role as the aging wings (Piyapong Piroon and Attaporn Lertmalaiporn) go through the transition process. 3. The Stages of Stardom: The path to stardom of Sorot Soontornsiri, for me, has felt weird. He started off being the Local MVP in the TBL2014 and got so much praise for a while that he felt overrated when the Vampires struggled in the early stages of the BTSL. Maybe it should have been considered more than he was learning to play without “Bas” Kannut Samerjai on the fly. Then suddenly I felt that he had been so overrated that he was suddenly too underrated. He might have struggled a bit here and there throughout the season, but he’s still just 22. He plays killer defense when focused up to a level where an opposing guard privately mentioned that he just wanted to give the ball to him sometimes. He will still make some questionable plays, but again the kid is 22. And he will flash some shots that make you marvel at his creativity like this inbounds pass to the back of Steve Thomas to get a shot off before the buzzer. Piyapong Piroon personally requested to mention his defense that saw this coming. While he did a good job of doing that, I’m going to use this space to just revel at Sorot’s creativity. 4. Trouble Magnet: For a second straight game, Sukdave Ghogar was caught in the middle of a controversial moment in the game. In the last game against the Madgoats, Dave was caught in a tangle with “JO” going for the intentional foul and was eventually called for an unsportsmanlike conduct. In this game, he got tangled up again in a fumble with Sorot Soontornsiri. This caused quite a commotion on the Mono Vampire bench as they probably viewed as a big guy like Dave falling on to Sorot as a threat. Were these two plays maliciously intended? I’d have no way of actually finding out, but they didn’t look premeditated. I certainly hope these incidents aren’t intended but Sukdave is a big guy with long limbs and sharp elbows so he’ll always be in the middle of situations like this. Sorot was fine though, no need to worry about that. 5. Let’s Celebrate: Shopper certainly knows how to celebrate his three-point shots. Most of the times, I’d enjoy a three-point shooter that celebrates his shots more solemnly like it’s nothing to him because it just seems more cold blooded. But in this case, Mono were playing their last home game, going toe-to-toe with the team that could be the Champions of the BTSL had they rolled over and allowed them to. Those circumstances made each and every Shopper Celebrated three-point shot more than acceptable in my opinion. 6. The Case of the Missing Offensive Rebounds: After watching the game, I made a note of the amount of the second chance attempts that Hi-Tech had. But once I looked at the box score, I was highly surprised that they were recorded for only 5 offensive rebounds. I’m guessing that the statskeeper doesn’t account tip-rebounds, but that left a big part of the game out of the records. 7. STEVEEEE: Among all of the players in this past BTSL, I feel like Steve Thomas has been my personal favorite. He posts numbers for sure, but that’s not why. Sure, he’s a great passer out of the double team. He also blocks shots with an attitude. He channeled his inner KD/Ray Allen to draw this foul on Anthony McClain. But none of that is more important than the fact that Steve plays with emotion and passion which you can see from his facial expression and body language that is too genuine to be forced. I mean, for a guy who has won 4 ABL Champions in the past 5 years and multiple awards before that, how can you not love the look of genuine happiness on his face when he accepts the trophy [Editor’s Note: He missed one crucial free throw that almost lost him the trophy as well though.] from Hi-Tech Owner, Nipondh Chawalitmontien? I don’t know about you, but I will miss him whenever the time comes for Steve to leaves the Thailand Basketball Scene. Hi-Tech wraps it up with a slim victory to clinch the BTSL title and the million Baht prize, but let’s take a moment to cherish the fact that it took up until the final weekend to decide the champion with plenty of twists and turns along the way. But the season is far from over! There will be the Basketball Thailand Super League International Invitational which will be played from 2 May – 10 May exclusively at the Nakhon Pathom Stadium. Aside from the 3 qualified Thai teams, there will be the Pro-Am SBL Allstars from Singapore, University of Taipei (Chinese Taipei), and Jose Rizal University Heavy Bombers (Philippines) participating as well in a round robin setup. The top four teams will play in a knockout play off round. Games will be televised everyday only for the 2PM to 4PM slot and can be viewed at Channel 3 Family. The opener will be between the Madgoats against the Heavy Bombers on the 2nd of May at 2PM onwards. Be sure to catch it! If everything goes as planned I’ll be attending this game live!